Forty three health workers in the Philippines were arrested and detained under trumped-up charges last February. They remain in prison today, with the new reformist president elected. We broadcast an interview we held with David Hendry of the local Alliance for People's Health. 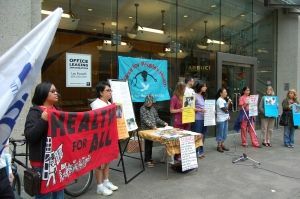 They held a picket outside the local Philippines Consulate. This interview was originally produced for the program Worm's-Eye View: News from the Grassroots on SFU's CJSF 90.1 FM.